Locally owned and operated, Gold Construction was established over 34 years ago by Randy Gold to provide the Wenatchee community with quality custom home services. We are proud to provide the highest level of craftsmanship and quality services that allow us to make our client's dreams a reality. As a licensed and bonded construction company, we have the skills and knowledge necessary to build homes of all different sizes. Whether you're looking to build a custom home or do a renovation, we can get the job done. With years of experience and exceptional craftsmanship, Gold Construction has had the pleasure of helping hundreds of clients create the home they have always wanted. We work closely with each client to understand what their goals are, and what we need to do to help fulfill them. No matter the size of the project, we will determine what steps need to be taken to complete the job on time and within the set budget. If you have your own house plans or would rather choose one from our collection, we always make it our goal to build a masterpiece. We also work closely with a local home designer that can develop custom plans to fit any specific site. Our clients come from all walks of life and age groups; from empty nesters, young families, second time clients, to those who are building that final dream home. 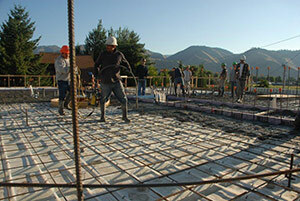 When you're ready to build a home you'll love for years to come, call us at 509-663-4946 today! We look forward to the opportunity to work with you.